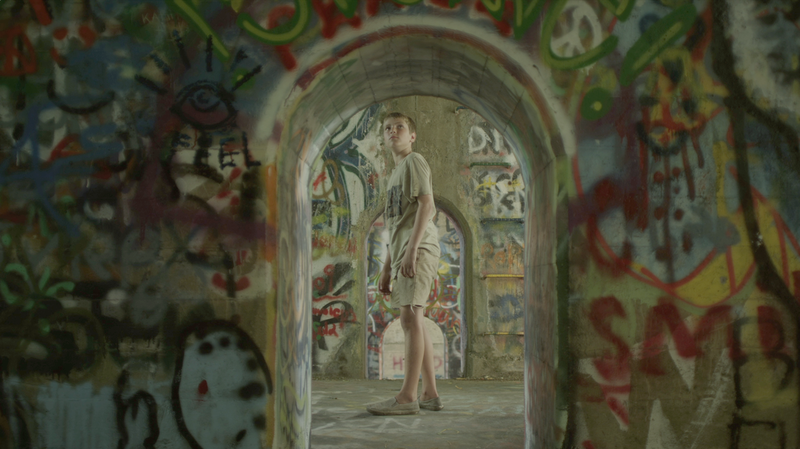 Movie Review: 'Hide Your Smiling Faces' In director Daniel Patrick Carbone's brooding debut, Hide Your Smiling Faces, brothers Tommy and Eric encounter the difficulty of growing up during one sleepy and sinister New Jersey summer. For parents dreading the prospect of their kids spending summer locked in air-conditioned basements with nothing but the glow of computer, TV, and tablet screens to keep them company, the opening scenes of Hide Your Smiling Faces will surely inspire wistful sighs. Living in a small New Jersey town where sporadic houses are far overwhelmed by the expansive woods that surround them, the most advanced technology that brothers Tommy (Ryan Jones) and Eric (Nathan Varnson) seem to possess in Daniel Patrick Carbone's debut feature is a discman that Tommy occasionally uses to listen to heavy metal music. Quickly and assuredly, writer-director Carbone puts us in the mood of these languorous summer days. Long stretches of silence and repeated shots of the kids wiling away the daylight hours captures that familiar boredom that neither Eric nor Tommy would trade away, since it also comes with an unfettered freedom to explore every inch of their still unfamiliar world. Danger lurks, though, when Ian, one of the two friends with whom Tommy spends his days, emerges from his shed showing off his father's handgun. That scene passes with no harm done, but it establishes a growing anxiety that flows through Hide Your Smiling Faces. A few scenes later, tragedy strikes when Eric discovers Ian's body at the bottom of a bridge, the victim of a fall that no one much bothers to determine as accidental or suicidal. Hide Your Smiling Faces is a striking companion piece to It Felt Like Love, another recent coming-of-age story, this time about two young girls, from a first-time director. Hide Your Smiling Faces is not as dark as It Felt Like Love, but like last year's Sun Don't Shine, the films share a strong sense for the sinister, for how flirtations with new experiences, with excitement, carry a nerve-racking risk of disaster. Hide Your Smiling Faces is not about the aftermath of Ian's death, nor directly about its effects on the community. Rather Ian's death is just the first of many unpleasant realities that materialize from beneath the carefree disguise of the film's opening scenes. After Eric discovers Ian's body, the long days of summer begin to look more like the long days of mourning; the silent shots of Eric, Tommy, and their friends playing get weighed down by the unspoken feelings that often fester underneath. With time, much of this subtext starts floating to the surface. "Do you ever thinking about dying," Eric's friend Tristan (Thomas Cruz) asks. Eric dismisses the notion — "You wanna die because you're sad? That's dumb" — but his own anger at the world also becomes more difficult to hide. In such emotionally turbulent waters, Hide Your Smiling Faces moves cautiously, perhaps too much so at times. Particularly in the slightly underdeveloped relationship between Tommy and Eric, the movie risks letting suggestions of themes and emotions stand in for the things themselves. But for the most part this lack of determinism proves a strength. Carbone is playing with familiar elements here: the confusion of coming-of-age, the transitional period of summer vacation. His approach, though, is rooted firmly in the children's point of view. Adults appear only sporadically, mostly to offer inadequate advice or half-heartedly attempt to assert control over their kids' lives. Following Ian's death, a preacher's attempt to reassure Eric that "God works in mysterious ways" quickly devolves into the far less appealing truth that "life's just tough." The lack of parental guidance means the cautious sexual explorations, angry outbursts, and whispered confessions that the kids experience are felt by them but not understood. As quickly as they occur, they dissipate, only to return a day or two later in the same confused form.